With talks about generative Design, web technologies, parachuting and hopefully something about conspiracies. 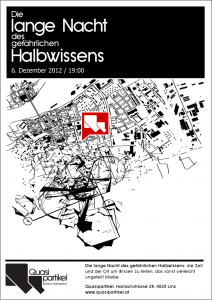 The “Lange Nacht” will be held irregularly, so if you have something to show, send us a message or drop by. This entry was posted on Friday, December 7th, 2012 at 2:10 pm	and is filed under Uncategorized. You can follow any responses to this entry through the RSS 2.0 feed. You can leave a response, or trackback from your own site. Wouldn't you want to be the first one to leave a comment?